Back in the day when aquariums had galvanized frames and high-end polished stainless steel trim, one was lucky to hear the term fluorescent lighting. Key hardware essential in managing successful aquariums has significantly evolved over time, to say the least. As technologies have evolved, many advances have trickled down to the fascinating hobby of aquarium keeping, and LED lighting is at the top of the list when talking aquatic lighting. LED powered lighting provides a whole new level of digital control. It is the best technology for allowing adjustment not only in the amount of light power being emitted but equally for colour temperature and spectral composition. We now clearly understand the benefits behind strong efforts in simulation of the original, natural environments of our fish, coral and plants. 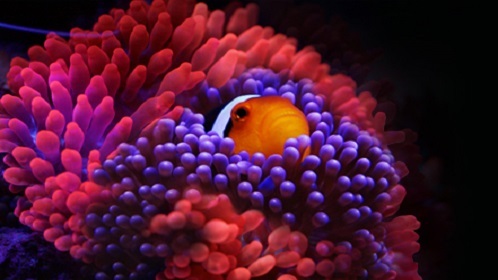 The proper aquarium environment not only includes attention to water conditions and the basic chemistry behind it, but also important external influences such as light. Lighting drives photosynthesis and many key life cycles in nature, it can be a major factor in successful aquarium keeping. Controlling light is accomplished in many ways by a number of different devices. Systems now exist that are part of computer networks with access via secure connections making remote actions simple and convenient. For example, with a smart phone, tablet or laptop one can easily access multi-function controllers that monitor various parameters and execute commands to assist in active aquarium management in your absence. Advanced controllers allow dynamic changing of light spectrum and intensity over the course of a normal photo period, potentially making natural light simulation even more realistic. There are ramp timers that will gradually illuminate at the beginning of the day within a range of time set points programmed by the user (or pre-set) to the end of the day, simulating both sunrise and sunset. This reduces fish stress and presents plants and corals with increasing and decreasing light levels that mimic Mother Nature. The basic timer is still much better than no timer at all. The turning on and off of more than one lighting system can be done to create varying intensities and spectrums of light. There are also dimming functions that can be automatically or manually pre-set, allowing gradual on and off intensities of light. These simple functions eliminate the very unnatural on/off of conventional lighting systems and the potential stress some fish can be exposed to. In fact, currently some basic smaller starter kit aquariums come with automatic dimming vs. a traditional hard on or off. The RGB LED (or Red-Green-Blue Light-Emitting Diode) is also used within lighting systems to actively create dusk to dawn while being able to contribute to special lighting effects, such as thunderstorms and cloud simulation. RGB technology has been with us for a few years now and with the 3 primary colours of red, green and blue within one chip, altering light characteristics in compact applications has become a reality. When considering light intensity and quantity do not lose sight of the fact that there are additional characteristics that are equally important. The quality of light as best defined by its spectrum is key. When choosing an LED lighting system, a variety of LEDs is usually always preferable to ensure a more complete and balanced light spectrum is produced. Lighting control also includes your lighting system choices and how you can best use them. When considering the Inverse Square Law and the physical fact that the strength of the field (in this case, light field or electromagnetic energy) is inversely proportional to the square of the distance from the source, it should be evident that the closer you get to the water’s surface with a light source, the more efficient it becomes. This is where superior engineering – that allows LED lighting to quickly expel heat and be strongly water-resistant (IP67 rating) – becomes invaluable. A concept so simple yet so overlooked by many higher-powered aquarium lighting systems. Thinking efficiency means getting the light source near the water’s surface to make the most of every watt of power consumed. If not, you are wasting energy lighting your aquarium with the intended source in addition to the room it is in. When it comes to the care and management of your aquarium, remember that lighting is a fundamental element to the life we maintain within it. Fluval unveils its all-new LED series for fresh- and saltwater aquariums, including high-performance strip lights, compact and powerful nano lights, remote control operation, ramp-timer compatibility, endless colour blends and much more.